Velothon, Stockholm’s largest cycling race, is right around the corner. The usual nightmare of traffic congestion caused by closed roads and poorly informed, frustrated public will finally be avoided. Interactive map CityFlow shows you the way ahead. At Mindconnect we have developed an intuitive interactive map that suggests routes that take into account the shutdowns in the Stockholm area. Velothon Stockholm cycling race starts at Stockholm center then heads to Nynäshamn then circles back. 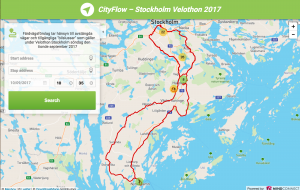 With CityFlow interactive map you can see the exact route of the race while effortlessly rerouting around it. “The more people who find out the current traffic situation, the faster the traffic flows, creating less stress and safer Roads”, says Gustav Järliden, Production Manager at Mindconnect, which operates the CityFlow traffic information service.